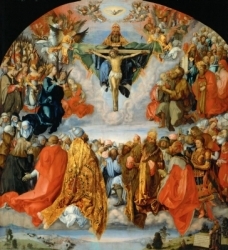 Instituted to honour all the saints, known and unknown. It owes its origin in the Western Church to the dedication of the Roman Pantheon in honuor of the Blessed Virgin Mary and all the martyrs by Pope Saint Boniface IV in 609, the anniversary of which was celebrated at Rome on 13 May. Pope Saint Gregory III consecrated a chapel in the Vatican basilica in honor of All Saints, designating 1 November as their feast. Pope Gregory IV extended its observance to the whole Church. It has a vigil and octave, and is a holy day of obligation; the eve is popularly celebrated as Hallowe'en. Rupert grew up in a family with five children and received his basic education in Stuttgart, Germany. Feeling a call to the priesthood, he studied philosophy and theology in Freiburg, Switzerland, then in Munich and Tübingen in Germany. Ordained a priest in 1899. Assistant pastor in Spaichingen, Germany. Joined the Jesuits in Feldkirch, Vorarlberg, Austria in 1900. From 1906 to 1912, he travelled around Germany, Switzerland and the Netherlands, preaching parish missions. In 1912 he was assigned to Munich where he worked with migrants who had come to the city looking for work. Father Rupert volunteered as an army chaplain in World War I. He worked for a while in a camp hospital, but was promoted to captain and sent to the front lines in France, Poland and Romania to minister to soldiers in the trenches. He lived with the soldiers, and was accepted by them. During combat he would crawl unarmed and under fire from man to man, encouraging them, praying with them, administering the Sacraments to them. In December 1915 he was awarded the Iron Cross for bravery, the first chaplain to receive the honour. In December 1916 he was injured on the Romanian front by an exploding grenade, and lost his left leg. Back in Munich after the War, Father Rupert returned to preaching, teaching, youth ministry and leading retreats for priests. He was there during the short-lived, communist-inspired “Bavarian Republic” of 1918 to 1919. Leader of the Marian Congregation in Munich in 1921. Beginning in 1923 he publicly announced that Nazism was incompatible with Christianity, and no Catholic could be a member of the party. This led to several arrests by the Gestapo including a six month stretch in “protective custody” beginning on 16 May 1937 after which he was sent for seven months to the Sachsenhausen concentration camp. In 1939, with his health failing and fearing his death would make him a martyr and a rallying point for anti-Nazi Catholics, he was released from the camp on condition that he stay in the Benedictine Abbey of Ettal and not preach. He was finally freed by Allied forces in 1945 and returned to Munich to spend his last few months back in his old ministry. Greek Catholic. Studied philosophy from 1930 to 1933. Studied theology in Rome from 1933 to 1937; received a Licentiate. Ordained on 25 December 1936. Drafted into the military, he served on the border with Germany; discharged in 1938. Minister to the impoverished parish of Berezovo, Maramorosh District. Professor of philosophy and spiritual director at the seminary in Uzhorod in 1939. Monsignor in 1942. Consecrated bishop of the Mukachiv eparchy on 24 September 1944. His eparchy was annexed into Soviet Ukraine on 29 June 1945. Teodor fought to preserve the rights of his Church during the occupation. The atheist government ordered the bishop and all the faithful to renounce any connection with Rome, and to submit to the Patriarch of Moscow. Romza refused, and the open persecutions by the State began. The government annouced that Nestor Sydoruk was the bishop of the eparchy, and faithful Greek Catholic priests and lay people were intimidated, harassed, abused, and imprisoned. Romza travelled his diocese by horse and buggy, ministering to his flock. Severely wounded on 27 October 1947 in a Bolshevik assassination attempt that involved ramming his cart with a motor vehicle, then beating him with rifle butts; he was later murdered in his hospital bed. His work helped many Transcarpathian Christians return from the Orthodox Church to the Greek Catholic. Martyr. Cousin of the founder of the noble Braganza family. Constable of the kingdom of Portugal, a knight, and a prior in the Order of Saint John of Jerusalem. Married. Career soldier, fighting for, and a hero of Portuguese independence. Widower. Lay-brother in the Order of Friars of the Blessed Virgin Mary of Mount Carmel at Lisbon, Portugal in 1423, taking the name Nuño of Saint Mary. He undertook the meanest duties in the friary, begging alms from door to door. Founded a monastery at Lisbon. Noted for a life of prayer, penance, and devotion to Our Lady. 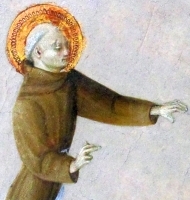 Franciscan Friar Minor who served as his convent porter and beggar in Borgo San Sepolcro (modern Sansepolcro), Italy. He was known for his humility, poverty, patience and service to the poor. Among the miracles attributed to him was the resurrection from the dead of two children, which led to his patronage of women in labour who sought his protection for their new children. In 2004, on the 700th anniversary of his death, the bell in the tower of the San Francesco church was dedicated to Ranier, and it is rung each time there is a birth in the town. Joined the Jesuits in Naples, Italy in 1578. Ordained in Goa, India. Missionary to Japan. Became fluent in Japanese, and lived as much like a native as he could, wanting to show that Christianity was no threat to a Japanese lifestyle. An imperial edict in 1614 expelled all foreigners. Instead of leaving, Peter went into hiding so he could minister to the converts he had made. He travelled the country disguised as a beggar, wood seller, farmer, and peddler in order to conduct covert Masses. He wrote on the faith, and translated Christian works into Japanese. Arrested by priest hunters in December 1621 along with two catechists, Petrus Onizuka Sadayu and Denis Fugiscima, and a layman, Clement Kuijemon. They were condemned to death by the Shogun on 27 October 1622. Father Peter Paul celebrated Mass and ordained his two catechists as Jesuit priests in the hours just before his execution. Raised a pagan; his father was even commissioned to persecute Christians by emperor Maximian. Mathurin converted at age 12. 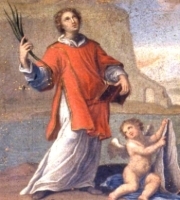 Priest at age 20, ordained by Saint Polycarp. Zealous evangelist in his region, even converting his parents. Noted exorcist, even healing Theodora, the daughter of the emperor; his ministry of dealing with the possessed led to his tradition of patronage of the mentally ill.
Old Testament Jewish Matriarch. Wife of the Patriach Jacob. She spent a lengthy marriage in shame over her sterility, considered a sign of God's disfavor. However, late in life she had two sons, Joseph, he of the many-coloured coat, and Benjamin. Deacon of an African church. During a visit to Italy, he witnessed a pagan celebration of Apollo; Caesarius objected to the human sacrifice it involved. For his interference, he was imprisoned for two years, and then for his faith he was martyred with Saint Julian. May have been the first bishop of Clermont, France. Contemporary of the three bishops of Aquitaine who attended the Council of Arles in 314. Born in the Basque country. Dominican. Ordained on 14 June 1851. Missionary to the Philippines and then to Viet Nam. Appointed coadjutor vicar apostolic of Central Tonkin, (modern diocese of Bùi Chu) Viet Nam and titular bishop of Centuria on 25 December 1857. 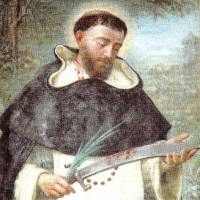 Martyred with Saint Jerome Hermosilla. Missionary to the areas of Marseilles, Autun, and Dijon in France, sent by Saint Polycarp of Smyrna. Martyred in the persecutions of Marcus Aurelius. 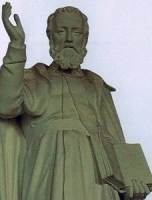 The people of Tours, France reverenced the grave of Benignus, but the local bishop wished to put a stop to the cult, believing the tomb to be that of a heathen who had been mistakenly identified as Benignus; he started demolition, received a vision explaining his error, and instead built a basilica over the restored sarcophagus. Benedictine monk. Abbot of Fontenelle. Part of the court and camp of King Clovis II. Chief almoner to Queen Saint Bathildis. Succeeded Saint Chamond as bishop and archbishop of Lyons, France in 657. Chartered the Abbey of Corbie, France. Chartered the Convent of the Blessed Virgin founded by Ebroin, mayor of the palace, and his wife Leutrude. In a conflict between Ebroin and Saint Leger, Bishop of Autun, Genesius took the bishop's side and was attacked by an armed band sent by Ebroin to expel him from Lyons. Genesius gathered his own forces and defended his city. Dominican. Missionary to Manila, Philippines. Priest. Missionary to Viet Nam in 1828. Vicar Apostolic of Eastern Tonkin, Viet Nam and titular bishop of Miletopolis on 2 August 1839. Bishop. Worked with Saint Joseph Khang. 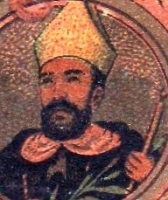 Martyred with Saint Valentin Faustino Berri Ochoa. Dominican priest. Martyred in the persecutions of emperor Tu-Duc. Ninth bishop of Paris, France. Chaired the Council of Paris in 360 - 361 which recognized the edicts of the Council of Nicaea in 325. Supported Saint Genevieve. Legend says that there was a dragon in Paris which was devouring women of "ill repute"; Marcel defeated it by striking it with his bishop's crozier. Born to the Japanese nobility. Jesuit novice. Worked with Blessed Paul Navarro. Martyr. Old Testament prophetess and judge. Married to Lapidoth. See the passage below from Judges that talks about her. Born to the French nobility. Count of Anjou. He gave up the title and worldly life to become a monk. Bishop of Angers, France, ordained by Saint Gregory of Tours. Priest of an African church. During a visit to Italy, he witnessed a pagan celebration of Apollo; Julian objected to the human sacrifice it involved. He was imprisoned for two years, and then martyred with Saint Caesarius. Studied at Paris, France. Priest. Benedictine monk at Savigny, France. Prior of the monastery at Talloires, France. Spent the last years of his life as a hermit. Convert to Christianity. Jesuit postulant. Catechist. Worked with Blessed Paul Navarro, and martyred with him. 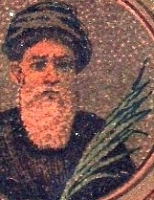 Sixth-century monk. 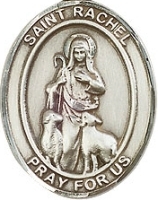 Spiritual teacher of Sadwen of Wales. Emigrated from Brittany to Wales where he founded several monasteries. First abbot of Bardsey Abbey in Wales. Llangadfan, Montgomeryshire, Wales is named in his honour. Archbishop of Milan, Italy from c.520 to 525. A poor man who lived in Leseven, Brittany, France. For many years was considered the village idiot - until people realized that his simplicity, poverty and unworldliness was due to his concentration on his own spiritual development. Abbot of monasteries in Ghent, Mont-Blandin and Saint-Bavon in Belgium. Worked with Saint Amandus. Layman martyr in the archdiocese of Nagasaki, Japan. Eldest son of Saint Brychan of Brycheiniog, and ruler of part of Brychan's kingdom. Benedictine monk. Hermit at Tivoli, Italy. A chapel in Wales is dedicated to him. Some sources say he was a prince, but no solid information has survived. First Christian king of Denmark. When he tried to bring his pagan people to the faith they revolted and killed him. Martyr. Martyred with Saint Juliana in the persecutions of Galerius and Maximian. Martyed with Saint Cyrenia in the persecutions of Galerius and Maximian. Son of a senator of Bourges in modern France. He died almost immediately after baptism, still wearing the white robes. Christian slave in the house of Tertullus, a patrician in Rome, Italy. Martyred in the persecutions of Diocletian. One of five 6th century brothers, all of whom are venerated as saints in Wales. Founded a church in Llangeitho, Dyfed, Wales. Fifth-century priest, monk and abbot in Bourges, Aquitaine (in modern France). Martyred with Saint John in the persecution of King Shapur II. Bishop. Martyred with Saint James of Persia in the persecutions of King Shapur II. Fifth century son of the chieftain Saint Brychan of Brecknock. Hermit in Llandovery, Dyfed, Wales. 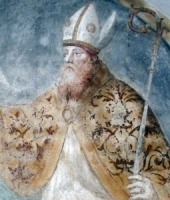 Bishop of Clermont, France from 640 to 650. Monk at Cor Beuno, Carnarvon, Wales. Abbess of the convent at Almenêches Abbey, France.